Welcome to the latest Choose Your Own Black and White Printables post. For those just joining us here’s the run down. 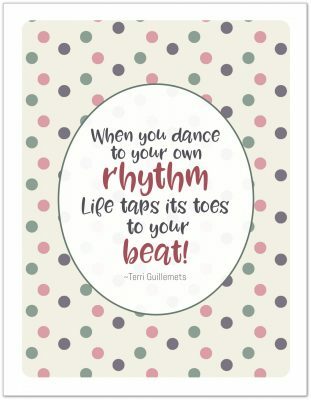 Each week I’m sharing black and versions of existing printables. The series will run until the requests stop coming in or I run out of printables to convert. If there is a printable (or many printables) that you’d love to have a black and white version of, just click the link above to fill out the form and submit your request. 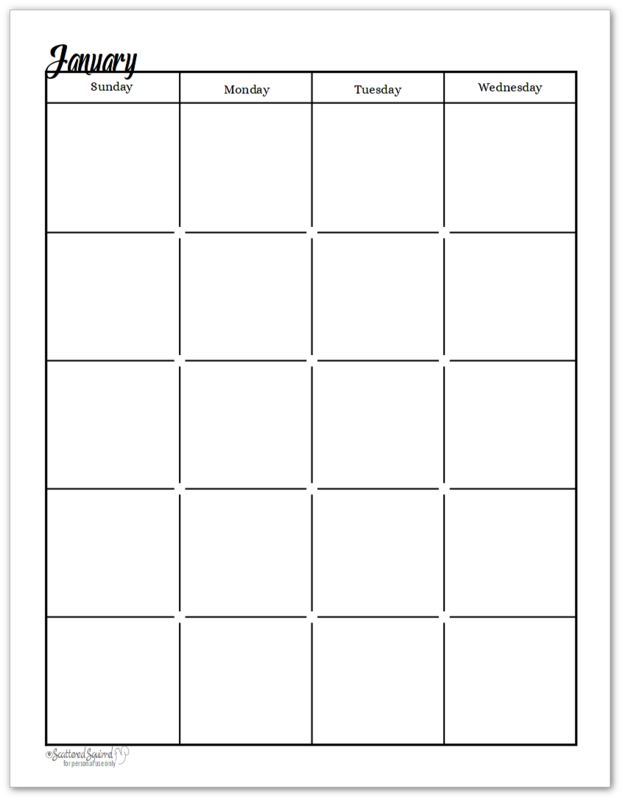 This time around I’m sharing undated black and white calendars that have two pages per month. I’ve been using a two pages per month calendar for a long time now. It’s my go-to layout whenever I’m setting up a new planner. I like to have room to jot down a lot of items if need be. A monthly calendar doesn’t need to hold all the details about events, but it’s a great place to put reminders so you don’t forget. 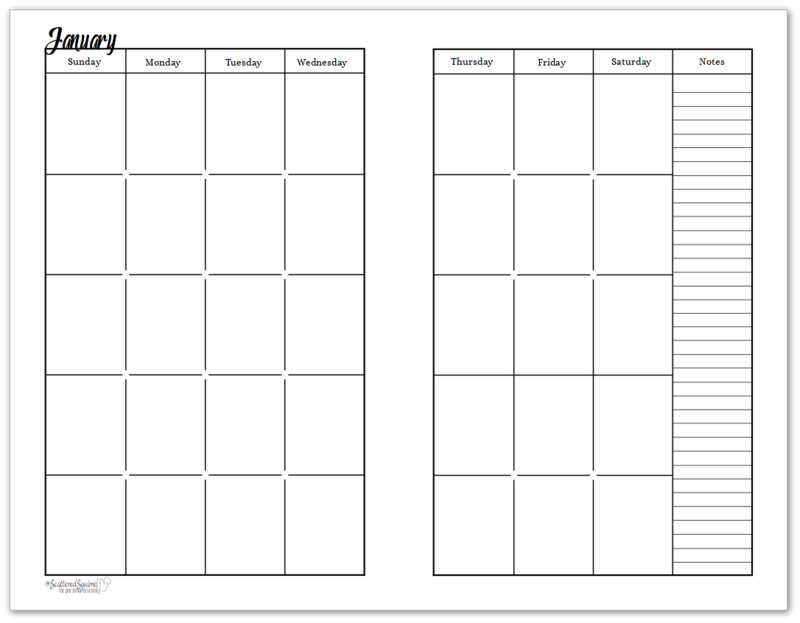 If you have a lot you need to keep track of in a month, using a two page layout (or spread) might be a good option for you. Like all the other black and white undated monthly calendars, I converted both the Understated Rainbow and the Sunshine Skies designs for these ones. If you’d like to see the Pretty in Pastel design converted to black and white as well, fill out the request form on the Black and White Printables page and let me know. These ones have more of a minimal design. The titles of each month are small and take up little room. I find these ones fun to dress up with washi when the mood strikes. First up is the full-size version. Though the picture only shows one side, I assure you, both are in the file. Each download includes all 12 months of the year to make it easier to download. Here we have the half-size version. The notes column is one my favourite features of this layout. I find it handy to have a place to jot down reminders or goals for the month. This next set of undated black and white calendars is from the Sunshine Skies design. I love how the script font seems to pop a little more in black than it does in blue. The script adds an element of fun to the months, which always makes me smile when I see it. Planning pages don’t need to be boring to be effective. The addition of lines in the notes column was one of the most requested changes I’ve gotten for the monthly calendars. After using the dated colour version of the 2017 calendars for a few months, I can see why. They make it super easy to keep notes and reminders neat and tidy. If you’re new to Scattered Squirrel, to snag a copy of any of the printables for yourself, just simply click the pictures of the ones you want and the PDF version will open for you to save. All of the printables are for personal use only. Almost every planner I use has a month calendar in some form or another. Often times when I’m planning my month out, I’ll put the same things into each calendar so I can always see what’s happening. I find this helpful because it lets me see when we’re busy and when we have free time. 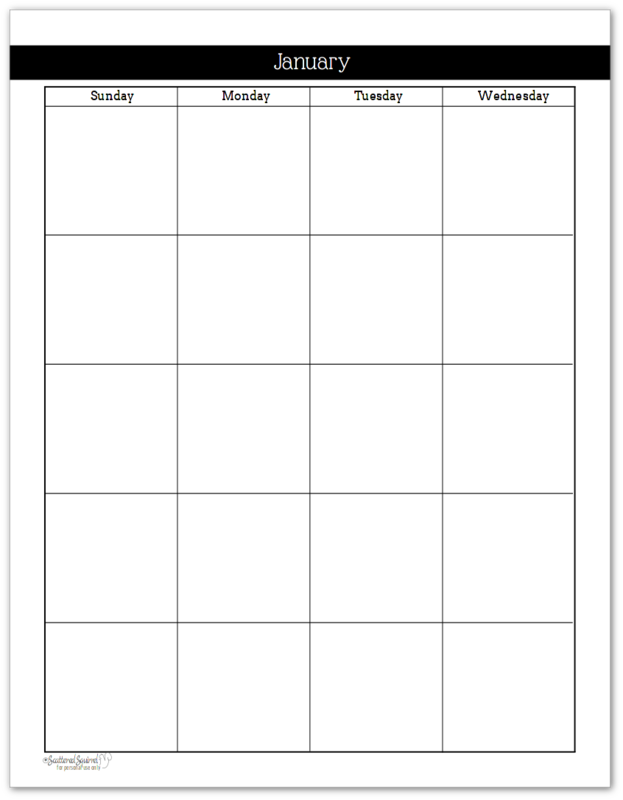 This helps me plan my work hours, family events, and projects around the home. Keeping our month as balanced as I can really helps keep our whole family from feeling overwhelmed. Because I plan so much on my monthly pages, I tend to use different coloured ink for different areas of my life. On these black and white calendars, the colours really pop and it is so easy to quickly see what’s going on. 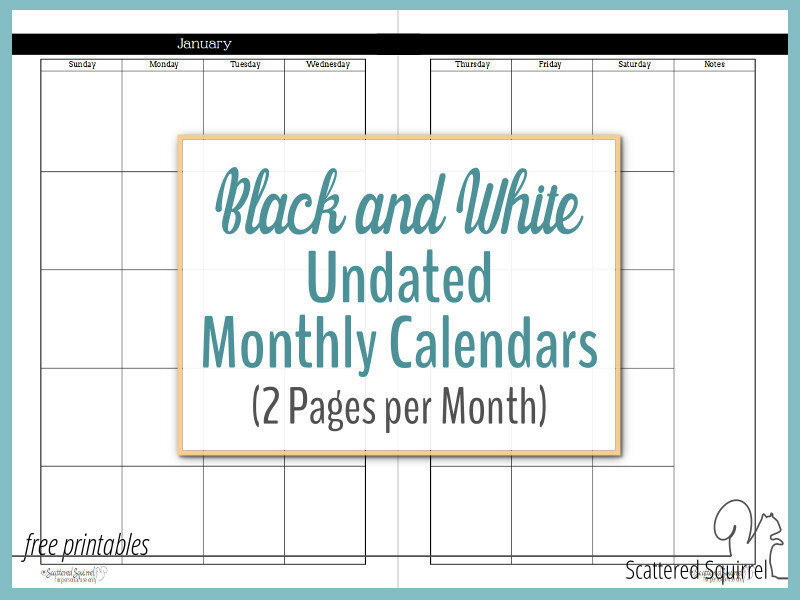 What do you think of the undated black and white calendars? Do you prefer the two pages per month or the single? Drop me a line in the comments below to let me know what you think. Also – if you happen to snap a photo of one of the printables you’re using and share it on social media I’d love to see it! Use the hashtag #scatteredsquirrelprintables and I’ll hop on over and take a peek. 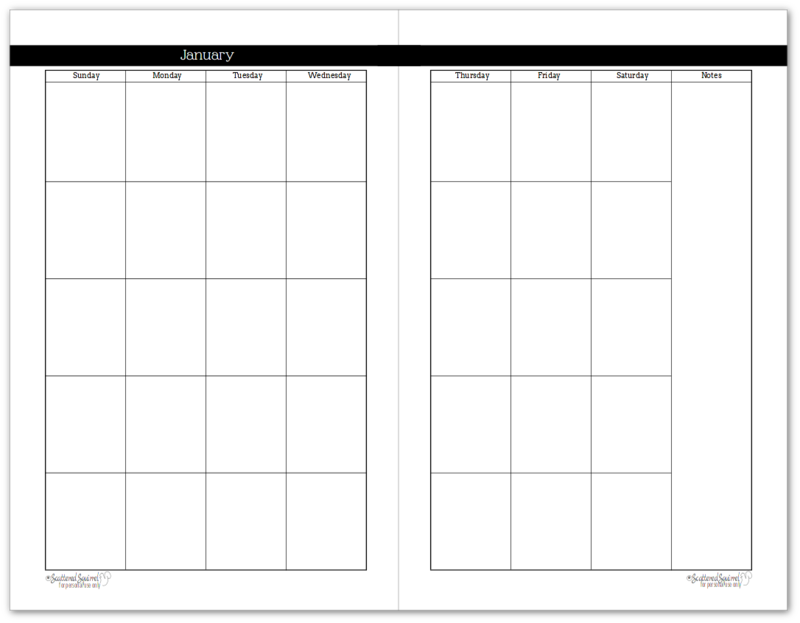 Next up, I’ve got the monthly planner pages, and I can’t wait to share them with you. Every few weeks I send out a newsletter with links to all the newest posts and printables! With your subscription, you also get access to our Secret Printables Library! Don't miss out on the fun! You can choose to unsubscribe at anytime.